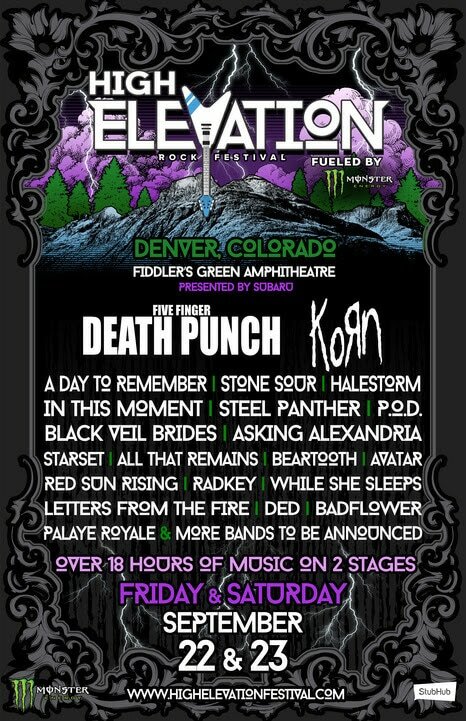 ﻿Published by Sareth Ney on April 18, 2017 at 9:00 p.m.
GREENWOOD VILLAGE, Colo. – High Elevation Rock Festival will be taking place at Fiddler’s Green Amphitheatre, on Sept. 22 and Sept. 23. Five Finger Death Punch and Korn will headline. There will be 18 hours of music and takes place on two stages. It is fueled by Monster Energy and presented by Subaru. A Day To Remember, Stone Sour, Halestorm, In This Moment, Steel Panther, P.O.D., Black Veil Brides, Asking Alexandria, Starset, All That Remains, Beartooth, Avatar, Red Sun Rising, Radkey, While She Sleeps, Letters From the Fire, Ded, Badflower, Palaye Royale and more bands will be announced for High Elevation Rock Festival. In 2016, High Elevation Rock Festival debuted and it took place on one day. Joe Litvag, Executive Producer of the festival of AEG Presents, spoke of the change. New additions to High Elevation Rock Festival will be the very important person (VIP) experience located at Marjorie Park. It is located on the north side of Fiddler’s Green Amphitheatre. The VIP section includes the following: shade, seating areas, premium food and beverage for purchase and private restrooms. VIP packages will be purchasable with certain ticket packages, while tickets last for upgrades to all ticket tiers. Presales tickets to attend High Elevation Rock Festival will be available for purchase at 10 a.m. Mountain Time, on April 19. For the presale ticket password, they will be released on the following social media platforms: Facebook, Instagram and Twitter. VIP tickets and hotel packages will also be obtainable to purchase. Tickets will be made accessible to the general public at 10 a.m. Mountain Time, on April 21. ​General admission lawn tickets are $99, general admission seated sections one and two are $129 and general admission pit are $225. The general admission pit tickets include Marjorie Park VIP Access and Premiere Parking. Upgrades are $50 each, while supplies last. General admission four packs are priced at $356. They exclude fees. Gold and silver hotel packages and military discounts are offered to purchase. For information on all ticket packages, click here.